Shigeru “Stu” Tsubota was born July 16, 1918, in Honolulu, the third of four sons in a family of eleven children. His parents were both immigrants from Hiroshima Prefecture, Japan. He graduated from McKinley High School in 1936. In 1940, he received a degree from the University of Hawaii in Agriculture, specializing in vocational agriculture. Among other activities, he was on the swimming, tennis, and football teams. He was selected for the Advanced Reserve Officers’ Training Corps (ROTC) as a sophomore. During summer camp training at Schofield Barracks in 1938, Stu obtained his nickname, due to his love of stew. In January 1940, he was commissioned a Second Lieutenant in the United States Army Reserve. While eligible a year earlier, he had to wait per regulations, until he was twenty-one. He taught briefly until he was called to active duty in the National Guard, 299th Infantry Regiment, First Battalion, stationed at Camp Paukukalo, Maui. Stu was aboard the SS Lurline in the middle of the Pacific Ocean when Pearl Harbor was bombed. The Matson luxury liner, used as a troop ship during the war, was on its way to the west coast. He and a fellow soldier were apprehended by the Los Angeles Police Department at the LA train station, on suspicion of espionage. He and his companion, a Swede and former University of Hawaii football player, were taking photographs at the train station. They were taken to the police station at City Hall and questioned for about ½ hour and then released in time to catch their train to Fort Benning, Georgia. After Fort. Benning, Stu returned to Maui, then he was sent to Schofield Barracks, and then to Camp McCoy in Wisconsin, from July 1942 to December 1942 There, he experienced his first white Christmas. From January 1943 to August 1943, he was in training at Camp Shelby, Mississippi where the 100th Infantry Battalion received its colors and the band played the kingdom and now state song, Hawaii Ponoi. 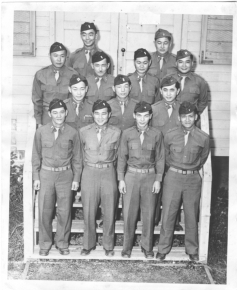 Stu was one of the 17 (differing accounts state this number as 16 or 18) original Nisei officers of the 100th Battalion. 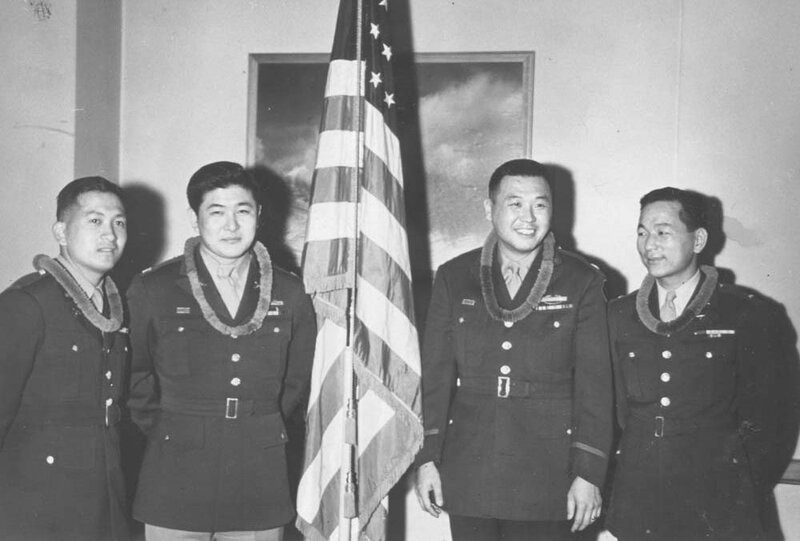 He calls himself the “Last of the Mohicans,” since he is the last remaining of the original 17 Nisei officers. In September 1943, the 100th Battalion was deployed to Oran, Algeria. It made a beach landing in Salerno, Italy later in the month to fight in the Italian Campaign. Stu was wounded in his right leg and back on the second day of combat, September 30, in the mountains north of Salerno. He was evacuated to a MASH unit in North Africa and then to U.S. Army Moore General Hospital in Swannanoa, North Carolina. He spent nearly a year there recuperating and was released in August 1944 and assigned to the War Department at the Pentagon. The next month, he was sent to Fort Snelling, Minnesota for the U.S. Army Military Intelligence Service Language School. During his long career of intelligence and counterintelligence work, Stu was stationed at the Presidio, San Francisco and Fort Ord, Monterey, California; at Fort Hood, Texas; Fort Holabird, Maryland; and Fort McNair, Washington, DC. He was also assigned to Honolulu, Heidelberg, Germany and to Sapporo, Kyoto and Camp Zama in Japan. In Korea, he commanded the 45th Counterintelligence Corps Detachment during the Korean War. Stu was the first Nisei officer selected to attend the Command and General Staff College in Fort Leavenworth, Kansas. While there, he was ranked number 4 out of 300 officers. However, because he was selected to tutor other students, his own study time was compromised, and he ended up graduating 37 out of the 300 officers, much to his chagrin. Stu retired as a Lieutenant Colonel at the end of 1963. At that time, he was Chief of the Security Branch, Intelligence Division, U.S. Army Europe in Heidelberg, Germany. He was then employed as a civilian counterintelligence officer for the U.S. Army from March 1964 to June 1981, when he completely retired and returned to his home in Novato, California, where he golfed, was active in veterans’ affairs, and worked on his small farm and orchard. He delighted in giving his produce to family, friends, and neighbors. Stu received many awards and decorations, including the Legion of Merit, the Bronze Star with Oak Leaf Cluster, the Meritorious Service Medal, the Army Commendation Medal, the Combat Infantry Badge, the Purple Heart, and the Army General Staff Identification Badge. From August 1944 until September 1986, when she passed, Stu was married to Rosemary Kayama of Seattle, Washington. They had five children. From 1988 until November 2006, when she passed, he was married to Mieko Kabutan of Honolulu. She had five children from her previous marriage. They lived both in Novato and Honolulu. After taking up full-time residence in Honolulu, Stu became more active in veterans’ affairs, especially as a member of Club 100, now the 100th Infantry Battalion Veterans organization. Stu, an excellent golfer, participated in and placed in or won many tournaments. He and Mieko travelled extensively and attended numerous reunion functions, both in Hawaii and on the mainland. In 2011, Stu moved to the Kahala Nui Retirement Community in Honolulu where he has lived for the last five years.